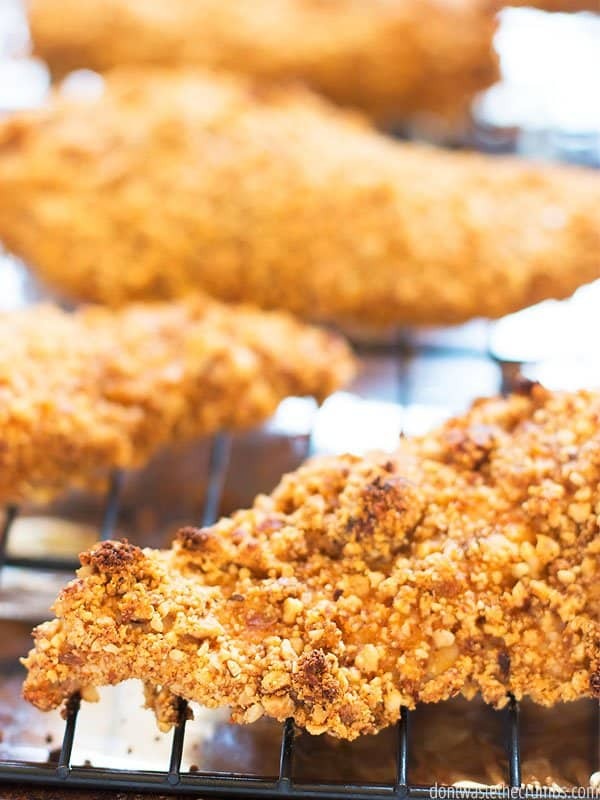 I laughed when my husband said the other night that this almond crusted baked chicken was his favorite of all the Whole30 meals I’ve made so far (including pork and potato soup and homemade breakfast sausage and caramelized onions and swiss chard and sweet potato and apple casserole and oven-roasted hash browns). I asked why, and he said his mom used to make baked chicken all the time when he was a kid. 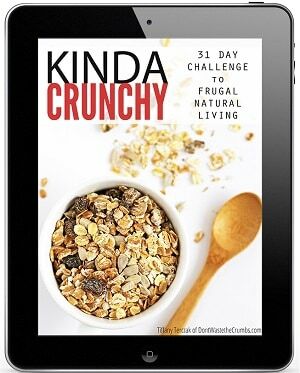 She used Corn Flakes or Rice Krispies. I remember it well too, because my mom used to do the same thing with Shake ‘n Bake. 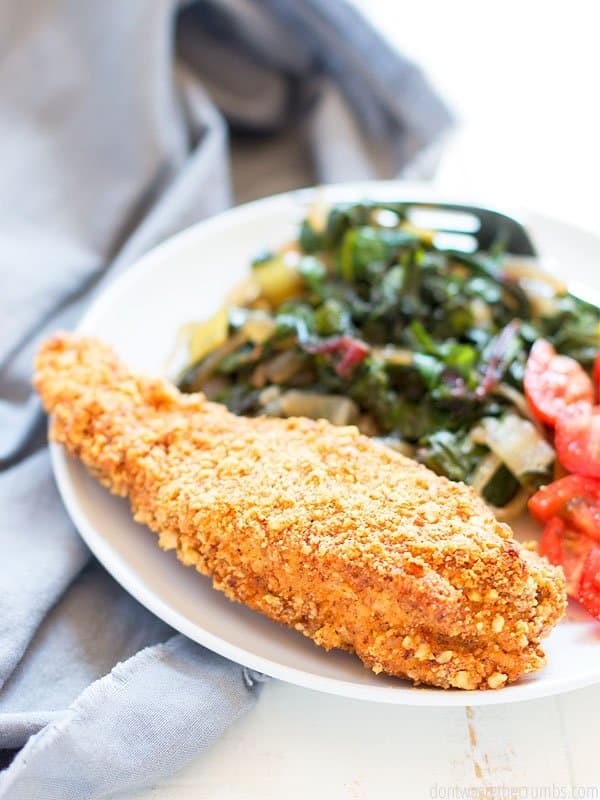 Almond crusted baked chicken is like what your mom used to make when you were a kid, but it’s grown up and healthier. And it’s downright delicious! 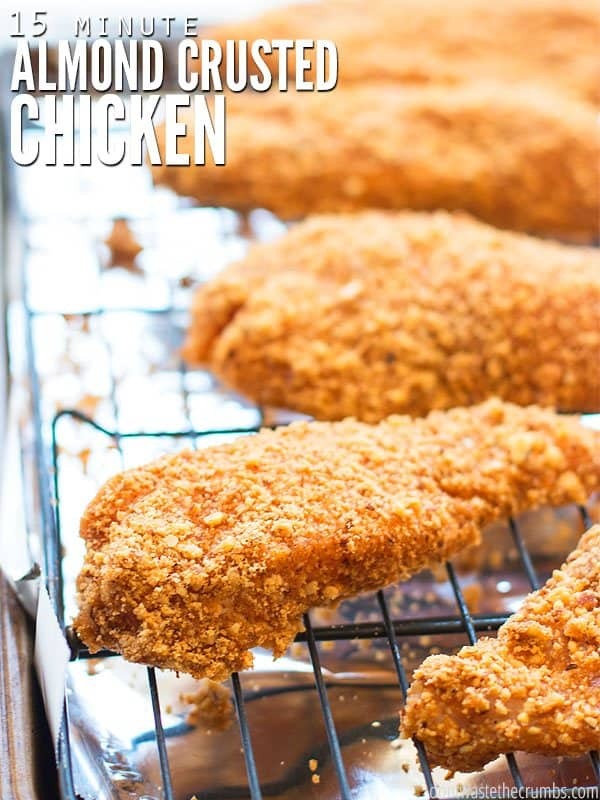 There are only two main components to any baked chicken recipe: the egg wash and the breading. I’ve tested this recipe MULTIPLE times over the past few weeks, trying all sorts of variations between these two components, seeing if it mattered if I did things one way versus another. It doesn’t really matter if you use an egg wash. If you are looking for that signature seasoned coating that crisps up in the oven, it really truly doesn’t matter if you use an egg wash or not. I tried one plain egg scrambled, one egg with a splash of water (similar to my famous scrambled egg recipe), one egg with a splash of almond milk and just plain water. None of these variables effected the end result. The chicken was crispy and DELICIOUS every time. It means that if you run out of eggs, don’t worry about it. If it’s the end of the month and you need that egg for something else (like a double batch of cinnamon oatmeal blender waffles), don’t worry about it. If you’re making a ton of baked chicken for a crowd and you don’t want to mix up a dozen eggs just to dip chicken into it and possibly have a bunch of chicken-contaminated scrambled eggs at the end that you aren’t sure what to do with, don’t worry about it. Just skip the egg wash. It DOES matter if you don’t season the coating. Those who aren’t on the Whole30 might use typical seasoned breadcrumbs (I recommend making your own Italian-style homemade breadcrumbs). Since gluten and grains are off limits at the moment, we’re relying on almond flour and almonds that I’ve pulsed in my Blendtec. Which flavor-wise, make for a bland coating. You must (MUST MUST MUST) season the coating. Otherwise you risk making a very boring dinner. Boring dinners aren’t allowed in my house (cheap yes, simple yes, boring no) so I season generously and my recipe below reflects that. You don’t have to use quite as much seasoning if you don’t want to, but trust me when I say don’t rely on the “salted” portion of the almonds to carry the flavor through because it’s not gonna happen. The only reason to use an egg wash. While you can totally skip using the egg wash (which is what I’ve done most of the time), using an egg wash does give you a more evenly coated breading on the chicken. I also found that when you use an egg wash, you don’t seem to use quite as much coating. If I was using homemade breadcrumbs, made from leftover homemade bread, I probably wouldn’t care so much about needing a few extra slices to make breadcrumbs. At less than 50¢ per loaf, that’s something my grocery budget can afford. 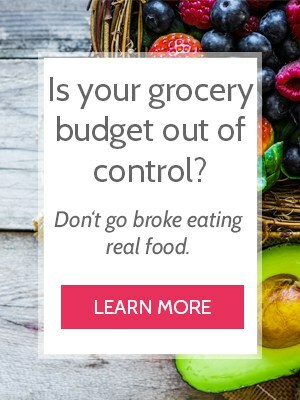 However, neither almond flour nor almonds are cheap. And I really don’t want to use anymore of either unless I absolutely have to. Or you skip the egg wash and you might have to make more coating halfway through. Pick and choose your battle, right? 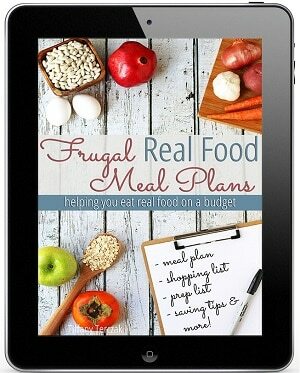 I wrote the recipe to reflect my preference for taste and ease, but know that the recipe is flexible based on what you have and your budget. Like most crusted baked chicken recipes, this doesn’t freeze well. Leftovers the next day, whether plain added to a hash or chopped up in a salad, are very good. But this isn’t something you’ll want to make tons of to stash in your freezer for a quick meal later on. I really liked the boneless skinless chicken thighs best because they were so moist, but again, use whatever chicken you have on hand. One final note – boneless chicken (or pork) will cook up pretty quick, so I recommend putting this in the oven when everything else is about 15 minutes away from being done. I like to get the oven preheating, get the side dishes going and then prepare the chicken. It can sit ready to go, on the pan, for awhile until it’s time to go in the oven. 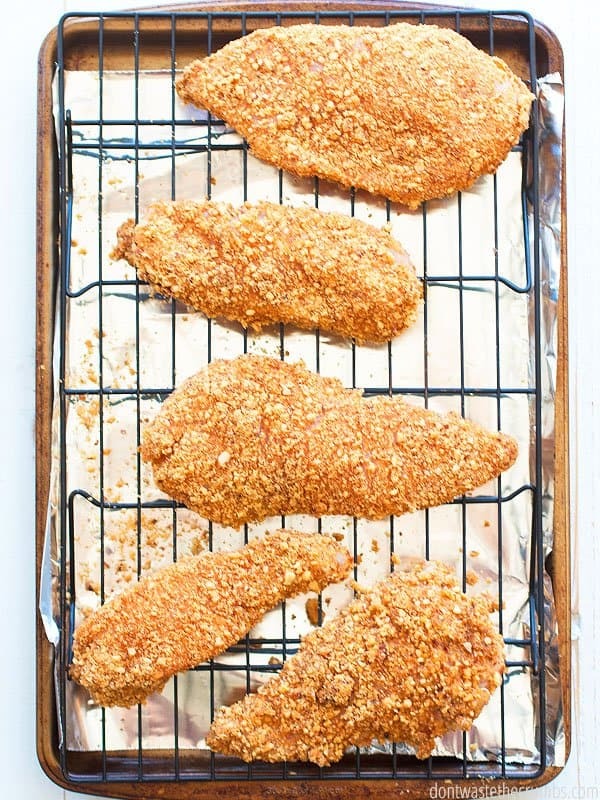 Bring back a healthier version of your favorite baked chicken with Almond Crusted Baked Chicken. The egg wash won’t make or break this dish. It helps even out the coating, but if you need your eggs for breakfast in the morning (cinnamon protein pancakes, anyone? ), skip them on the chicken. 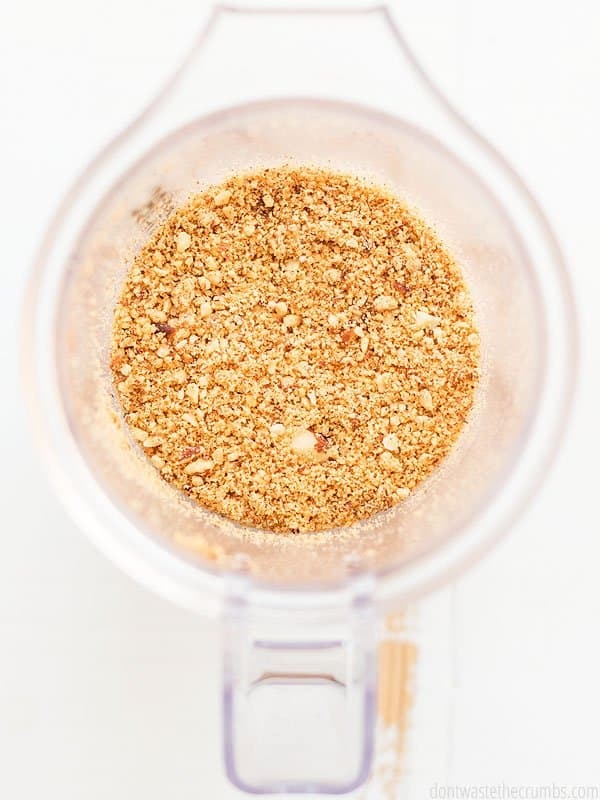 To get the crisp delicious coating on your chicken, make sure to blend up your almonds and seasoning in a high powered blender (like this one). 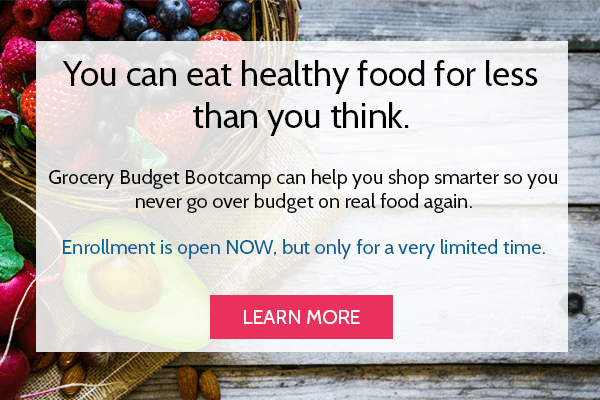 Although almonds and almond flour are pricier items, you can stock them in your frugal real food pantry by using the techniques learned in Grocery Budget Bootcamp. Take advantage of that rock bottom price! Line a cookie sheet with aluminum foil. Place a cooling rack on top. 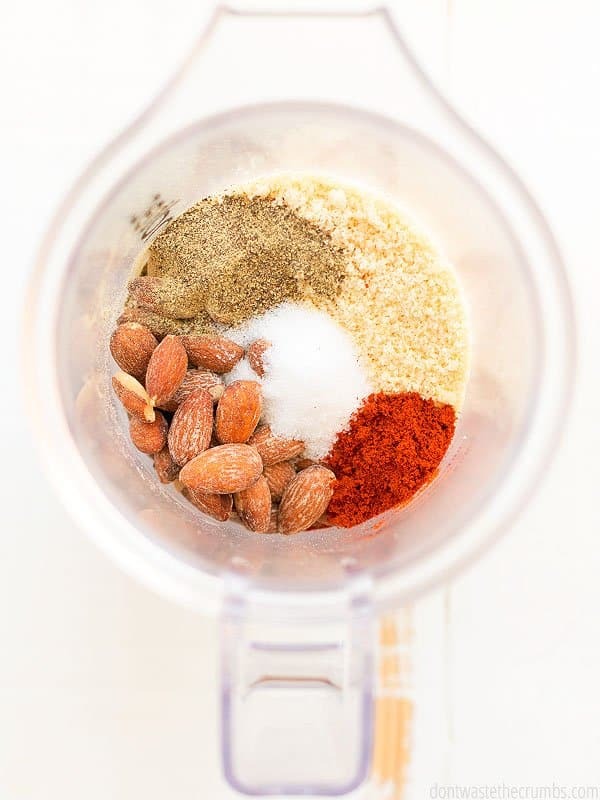 Combine the almond flour, almonds, salt, paprika and pepper in a blender or food processor and pulse until the almonds are in small pieces (half a pea, or smaller), about 4-6 times. Make sure not to over process, or to process for longer spurts, otherwise the almonds will release their oils and you'll make almond butter. Pour this into a shallow dish. In a separate shallow dish, crack the egg and add the water or milk. Whisk well. Bake the chicken for 15-18 minutes, or until the juices run clear. Serve warm. * If you run out of the almond coating, you can either make a small half-batch using the ratio of 2 Tbsp flour to 1 Tbsp whole almonds, OR just sprinkle more almond flour into the bowl. I tend to do the latter since it's easier. Do you have a dish that reminds you of your mom’s cooking when you were a child? Leave your memories and ideas in the comments below! So do you bake the chicken still on the cooling racks? Hi Tiffany, so if I use the racks I do not have to turn the chicken? That would be great. This looks delicious, it looks like you served with the caramelized onion swiss chard, but what is the other side with the tomatoes, that looks great as well. What would be a good whole 30 alternative to almonds…Just a different nut flour? I’m allergic and so many grain free recipes call for it…such a bummer. Yes, any nut flour would work! 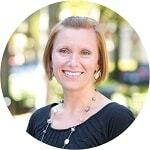 I haven’t tried that substitution Laurie, but if you’ve done it before with success, it should work! We don’t have almond flour because we don’t use it. I do like almonds and I bought some for a recipe but might have gone a little over board on the almonds when I bought them. Could we just use regular flour in case we buy the almond flour and don’t like it and then what? I have a wish. When something isn’t something you have ever used, and it’s a new product or just something most people don’t use all the time, I wish they would make a trial sized box or bag or whatever of it. That way if you try it and you don’t care for it, you are only throwing away a little bit, not a whole, full sized package. Okay, I will get off of my soap box now. LOL I want to try this recipe and I do love the corn flake chicken recipe. I have made that many times but we don’t make shake and bake anymore. Oh my, epic fail! Pulsing 4-5 times I had whole almonds with some chunks out of them. I continued to pulse and even after more than a dozen pulses I had huge chunks. My food processor has speeds and you didnt say what speed, could that be the problem? Help, cuz this sounds and looks great – well, yours looks great – not mine. I don’t have a food processor Cindy, but I used my Blendtec with the “pulse” button so that’s how I processed the almonds. I’ve made this many times, including just two days ago, and it takes me maybe 6-8 rounds to get them into small pieces. If you have whole chunks, stir or shake up the contents of the container so they shift around a bit. Sometimes one or two almonds can get stuck and make the whole thing not work nearly as smooth as it should. Delicious! Reminded us of chick-a-filet but better. That’s a high compliment – thank you Megan! Can you make the breading ahead of time? Do you use raw almonds or dry roasted & salted? 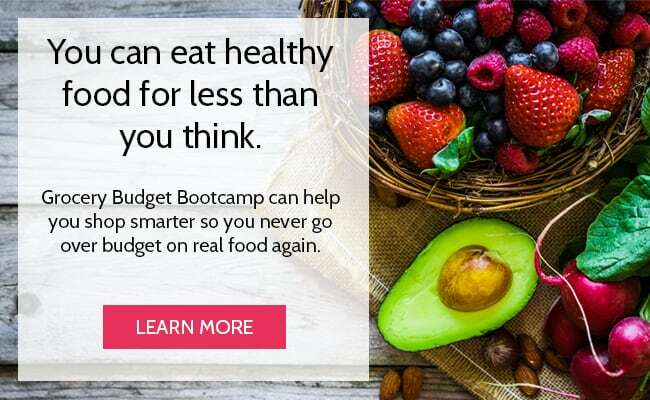 Can you use almond flour and flaxseed meal? That would probably work Lakesha!